Lots of housing news today and much of it seems contradictory. The upshot, in my view is that things are not as good for either buyers or sellers as each one thinks they are. Housing usually gives a boost to the economy, but in this cycle, housing needs a boost from the economy — in the form of more higher-paying jobs. 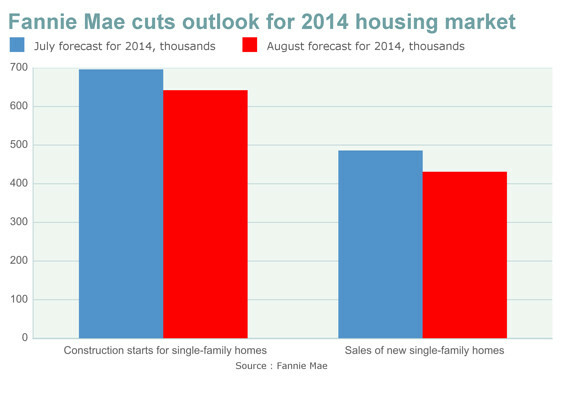 One bit of news that could be surprising to some: Fannie Mae chops outlooks for housing in 2014, 2015 – Capitol Report – MarketWatch. Also see: Why the housing market is recovering slowly—and could continue its sluggish pace — Amy Hoak, MarketWatch.com. Amy says there are strong markets in coastal metro areas where high-paying jobs exist. Elsewhere, appreciation is slowing, but she doesn’t think “collapse is imminent.” (I guess that’s some comfort.) She also notes experts’ difficulty in predicting where the market is going because of volatility in numbers reported this year.